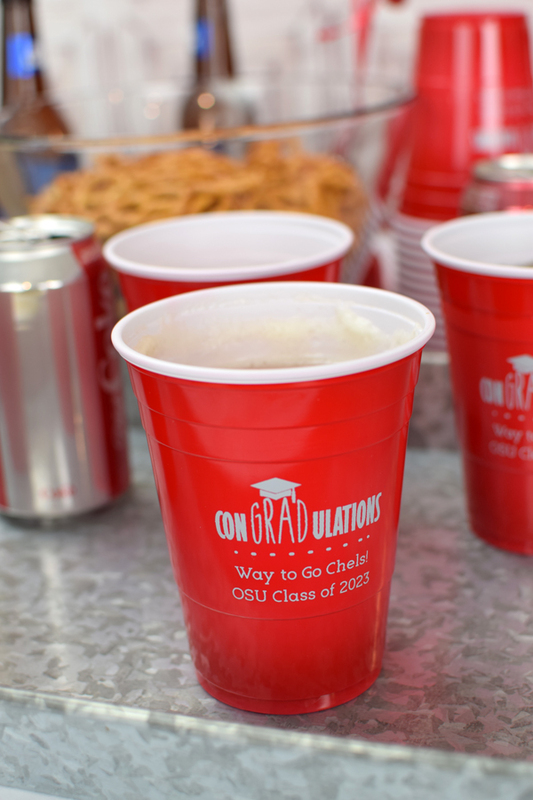 Perfect for an outdoor party, BBQ, or backyard bash, decorate and celebrate with disposable, custom printed graduation party solo cups personalized with a fun design and your own custom text. Our most popular cup size, these disposable, 16 ounce Solo cups are your typical sized Solo cup. Ideal for serving beer or soda. Made from disposable, soft-sided plastic. Personalized with a graduation design and your own custom message. Choose from 3 cup color options. Free back sided printed available. Loved the cups! These were such a great find and worked so great for our graduation party. I loved that there were several designs and colors to choose from and they emailed me a proof before making them and quick delivery once I approved. I highly recommend! I will definitely use them again!! Everything I expected, love them!! I made a mistake in my order and customer service called me right away. Made suggestions and my cups are perfect!